Branding in front of and behind the curtain - ThoughtForm, Inc. When we talk about brand architecture, there are two very distinct views. There is the identity that is visible to consumers—the external facing brand in front of the curtain. And just behind the curtain, there are resources and systems that influence the brand internally. One can’t exist without the other, and overall brand success depends on the unique purposes and participants on both sides. Internally, the way a company is organized begins the foundation that defines its brand architecture. Constructing solid brand architecture requires a clear perspective on budget and resources, and on customer base and market demands. Where does the responsibility for brand management live in your organization? Marketing? Communications? Is it centralized and managed by one person in one department? Or is the responsibility for the brand dispersed across the whole enterprise? How branding is managed internally colors what audiences perceive of the brand externally. If the management of the brand is dispersed and no one person or department really “owns” it, the brand can look diluted or even confused in the market. If there’s a strong brand manager with a dedicated branding team, the brand will more than likely appear focused and clear. And this branding team should include a diverse staff that brings all aspects of your business to the table, creating balanced and realistic expectations for your brand. Other internal factors that impact the brand are finances, strategy, and business plans. Any one of these could inform the budget and resources a company is willing to spend on establishing and marketing the brand. And that’s true whether you’re a Fortune 500, start-up, or nonprofit. The business ecosystem is where pragmatic, dollars-and-cents realities come head to head with your brand vision and execution. Dream big but dream smart. Business realities will always mitigate your brand vision. A brand is your promise to your consumers, and if you break that promise you risk losing their trust. Decisions you make internally can effect how your audience perceives your brand. Keep these three discussion starters in mind during your brand building conversations. Model your brand. Build a straw man diagram of your brand architecture and have key stakeholders react to it. Two diagrams can represent current state and future state (and how you move from one to the other). And make sure you visualize the relationship between your parent brand and sub-brands or product brands. Use all of these visual methods to build brand consensus in your team. Connect the dots between your brand diagram and your strategic goals. Your brand’s success will not happen if it’s not in alignment with, and supported by, your business strategy. Create audience personas. Whether you’re a monolithic brand or a collection of sub-brands, there’s a good chance you have multiple audiences. Know those audiences and what speaks to them. Create audience personas that describe every customer type and answer important questions about their motivations and why your brand attracts them. You might guess that if a company is complex with lots of departments and products, the brand architecture, or brand family, that the customer sees is also complex and varied. Not necessarily. It’s easy to think that the brand picture is an organic outgrowth of the company’s internal structure, but it doesn’t have to be. Companies like Procter & Gamble or Unilever are complex and have hundreds of products. And in front of the curtain, hundreds of products is exactly what the world sees… not the parent company itself. McDonald’s is equally complex, but the market’s perspective is focused on a singular brand image. The “Golden Arches” are an instantaneously-recognized symbol of all things McDonald’s. 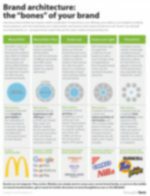 P&G and Unilever use a classic Pluralistic approach, while McDonald’s remains the classic Monolithic powerhouse. Read more about these brand architecture models in our brand architecture white paper. As your company matures, it bends and changes to meet market demand. The architecture of your brand should follow suit. Most successful companies have figured out that change is good, and status quo is not. Responsive companies are malleable and determine how to change their “spots” if the market demands it. You can do this and still maintain your core values and purpose. It’s simply a matter of evolving your brand. This might seem counter to what we usually think about brands—they’re fixed, constant, and unwavering. Consistency is good, but an ideal branding program builds in flexibility and takes advantage of opportunities to reinvent itself and stay current within its mission. Observing public reception should be a recurring step in shaping your brand. Start with these two tips. Benchmark your brand by looking at what the competition is doing. If you like what you see, figure out how to adopt certain aspects that you can make your own. If you don’t like what you see, take note and steer clear of the pitfalls. Never blink. Always observe the health of your brand and how it’s being perceived in the marketplace. Periodic brand audits are essential to keeping your brand refreshed and powerful. An easy way to do this is to survey your customers and ask questions about your brand’s recognition, loyalty to your brand, and its impact compared to your competitors. We used to think that the “face” a company presents must mirror its internal organization, that if it didn’t, the company was presenting a false picture to its audience. This is not necessarily the case. Savvy companies have complete control of how the internal structure of their company, and equal control of what external images and messages are most beneficial to their audience. These two views must complement each other, but do not have to be synonymous. In the end, brand management is not a collection of fixed rules, but a continuous workflow of strategic discussions, creative thinking, and brand vision. Enjoy the process.